This entry was posted in family, photos, quotes, spirit and tagged children, Christmas, family, grandchildren, grandparents, holidays, photos, quotes by Lilli Day aka bookbabie. Bookmark the permalink. A wonderful family portrait! That baby makes any photo shine – what a glowing smile! I have had a Kindle for several months and love it – don’t know what I’d do without it now. It’s just great for travel. (And reading in bed!) Having books available in a matter of seconds is also very nice. Yay!! I see a new cutie in your banner! I hope you had a lovely holiday. It sounds as if you did, even though I know that you were missing your mom terribly. Yay on the Kindle! I think I want one just to have for those certain moments but I know that I could not use it as my primary form of reading. 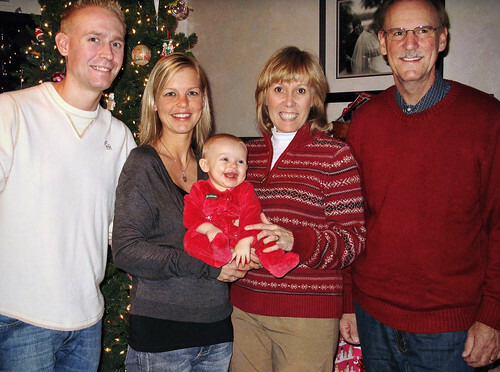 What a beautiful family, Lilli… I know your Mom is smiling down on all of you today. Love that picture of all of you… The baby is so photogenic. AND you look FABULOUS. That’s a beautiful photo. And yes, I agree Christmas is always both happy and sad, when you’ve lost someone special. It’s never quite the same again. But what a joy to celebrate your first Christmas as a grandma ~ that’s really special. And that quote at the end of the post … oh so true. Thanks for reminding me. Very lovely photo of grandma’s first Christmas. A memory keeper and treasure. Everyone looks so happy! Great shot! Happy New year, late but still wished, to you. i got to meet my nephew again and his world is a smile that makes all smile. he’s so sweet. that new technology entices, and then i think i like a book in hand to scribble in, then you are right, the type face can be increased (as i am learning by surfing on the ipod touch i so didnt want but am loving now.